Titanium Knights Episode 3: Next page in progress. 3500AD: Temporarily on hold as I work on Titanium Knights Episode 3. Here is where you will find different comics pages. Complete comic issues will appear in coming months. Here is the first remade page of the Titanium Knights comic. I originally had 2-3 pages, but all the original artwork was stolen. I created this page some years after the loss. The art is similar to the original, major changes include a female officer instead of a helmeted officer, and one officer at the controls instead of three, and the shape of the screen was originally rectangular. Enjoy! Here is an unfinished page of Antiballs Force (also known as AB Force). The AB Force is constantly at odds with the Geek Gods and their pesky minions. The AB Force comics used to be quite lewd, with giant genitalia being used as weapons against them. I have decided to clean up all the characters in the comic, and continue using them in milder "Toilet Humor" comics - you know, stuff like farts, corny jokes, etc. Why did I decide to clean up the AB Force, and not leave them as they were? I do not want to be famous for writing and drawing "nasty" comics. This is a comic I made in high school. The main characters here are Indestructo and Super Sword. (Yes, a sentient, flying, talking sword!) It is the second installment in a 4 part series. Unfortunately, they were all stolen, and I only have copies of parts 2 and 3. Part 3 will be coming soon, enjoy! This comic series is offically titled "The Adventures of Indestructo, Super Sword, The Ninja, Wrestler, Fat Guys, and Bums". There is also a shorter official title - "Corny Comics Crusade". 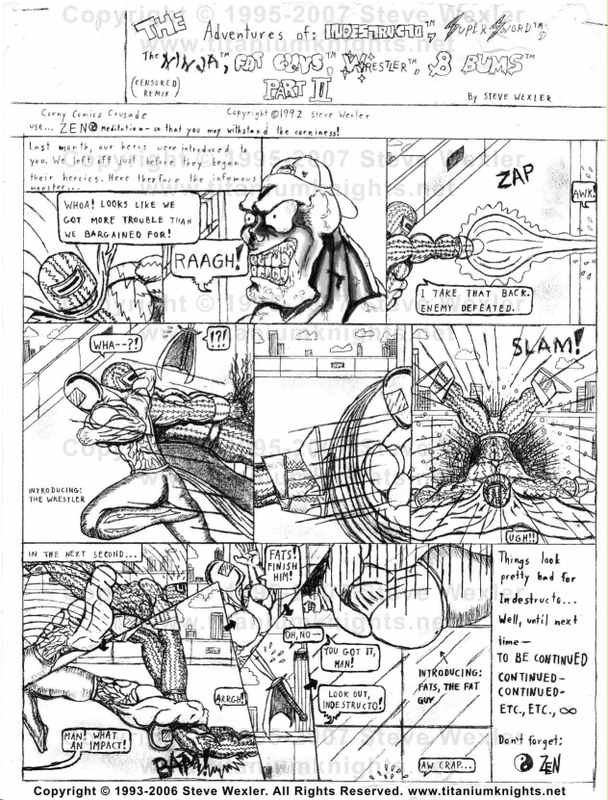 Well, here it is, as promised - the third - and last surviving - installment of my High School comic. I made these for my school paper, which was a cool project to work on. 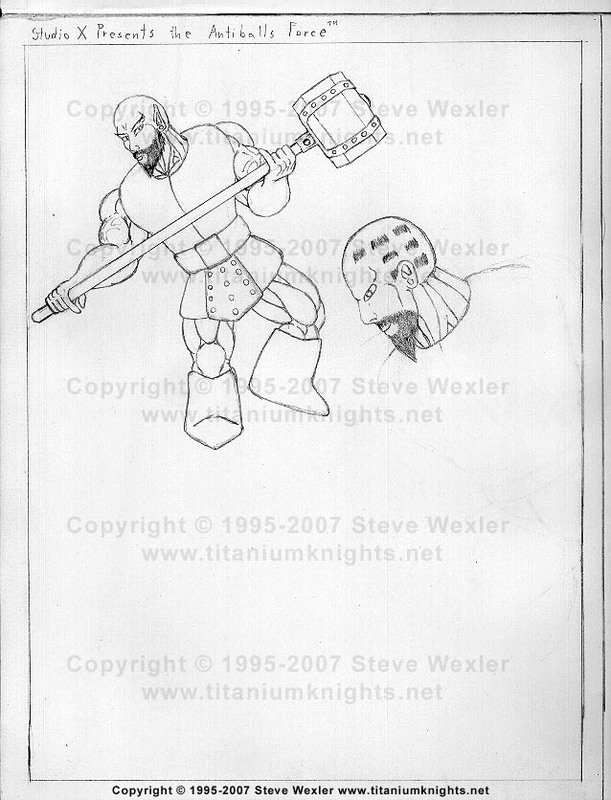 More art is on the way, including concept art for the Titanium Knights comics. Enjoy! I made these comic strips using the Make-O your own Stinko game over at Homestarrunner.com. It's quite an amazing and crazy website, by the way. Check it out! I always laugh when I look at these strips. I'm a sucker for fart jokes. I may make a another story arc for this, but I'm not sure yet. In any case, laugh it up! Copyright © 1992-2018 Steven Shawn Wexler. All Rights Reserved.